Listening: Girl Talk. I just wish this spiffy visual breakdown included dates for all the sources, because I strongly suspect I’m getting a remedial crash course on all that happened in pop music for the past quarter century while I was busy listening to the likes of Cachao & Gillian Welch. Eating: Peas! Peas! Peas! How about a simple recipe? Cover one slice of bread with cheese. Dot peas all over. 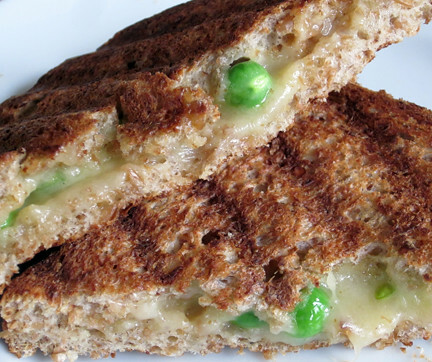 Put the other slice of bread on top & hold it together carefully (no escaping peas!) as you place the sandwich in a sandwich grill or press of your choice (we use a George we found on the street). Grill til cheese is melty. Yay, cheesy peasy!